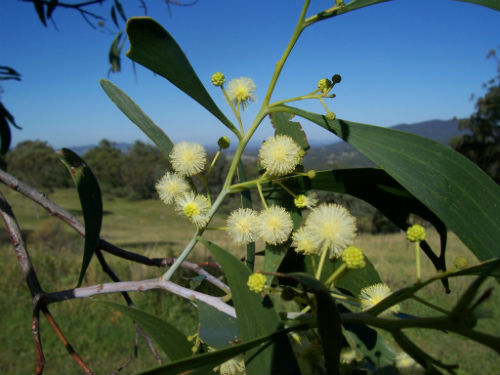 Acacia implexa, the Hickory Wattle, is a small to medium sized tree that will reach a height of 12 metres. Bark is rough and greyish. Phyllodes are sickle-shaped and up to 20 centimetres long with a small basal gland. Thirty to fifty cream flowers are held in ball-shaped clusters and these are carried in axillary racemes. The main flowering period is in summer with sporadic flowering at other times. The pods, that follow the flowers, are curved, coiled and twisted. On our Yallaroo property A. implexa has regenerated in large numbers since sheep were removed over 20 years ago. Hickory Wattles is a versatile plant. It flowers when other wattles have finished. The foliage is used for dyeing cloth, the bark for tanning leather and the wood for furniture and tool handles. The species also produces excellent, long burning firewood. Crimson Rosellas are partial to the ripening seeds. A. implexa suckers and could be used for erosion control. In cultivation species could be used in windbreaks and woodlots. A. implexa occurs on the coast and ranges from Queensland to Victoria. There is also a population on King Island in Bass Strait. The species name means refers to the gnarled appearance of the seed pods. The type specimen was collected in the early 1800’s in the “Ravines of Shoal Haven River, E. Coast” by Alan Cunningham.